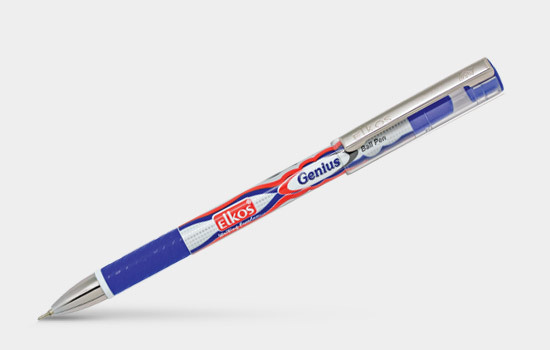 Elkos-Genius, a one stop solution for hassle free& smooth writing and is developed specifically for use on all types of papers with no more mess. Elkos pens, the popular choice for classroom, office and daily usage products, launches its new ball pen as an extension to their wide range of office and classroom products. Elkos-Genius, a one stop solution for hassle free& smooth writing and is developed specifically for use on all types of papers with no more mess. Genius ball pen is based on Korean technology with long lasting refill and well-designed scientific rubber grip, and is all about pure writing and huge on performance hence, differentiating it from the rest. It is quick and easy to use and extremely safe especially for children. Geniusis cost effective with its contemporary look and appeal suits all personalities' right from the school goers to the professionals. It is best suitable for all type of usage be at classroom, homework, underlining in offices, for executive & professionals, as well as for daily usage. Elkos Genius comes in attractive foil design and stainless steel pocket clip for an executive look and feel. ELKOS Pens has been certified by the standards of ISO 9001:2015(QMS), awarded the prestigious Government of India registered One Star EXPORT HOUSE & has a distinguished honour of being stationery partners in reputed Indian educational institutes like IIT's & IIM's.